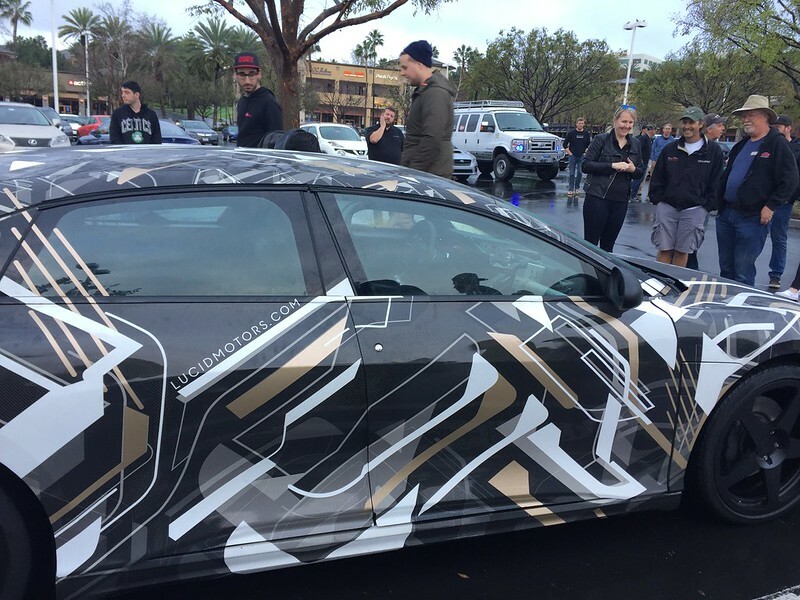 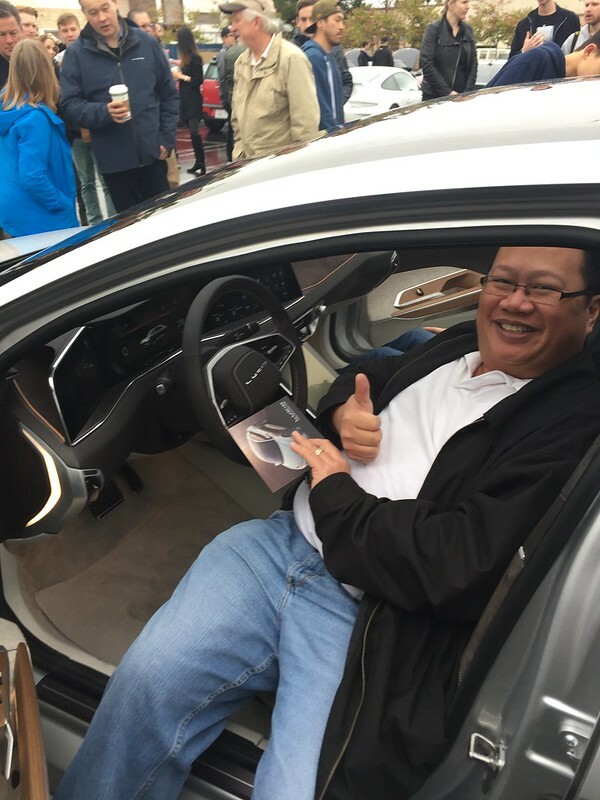 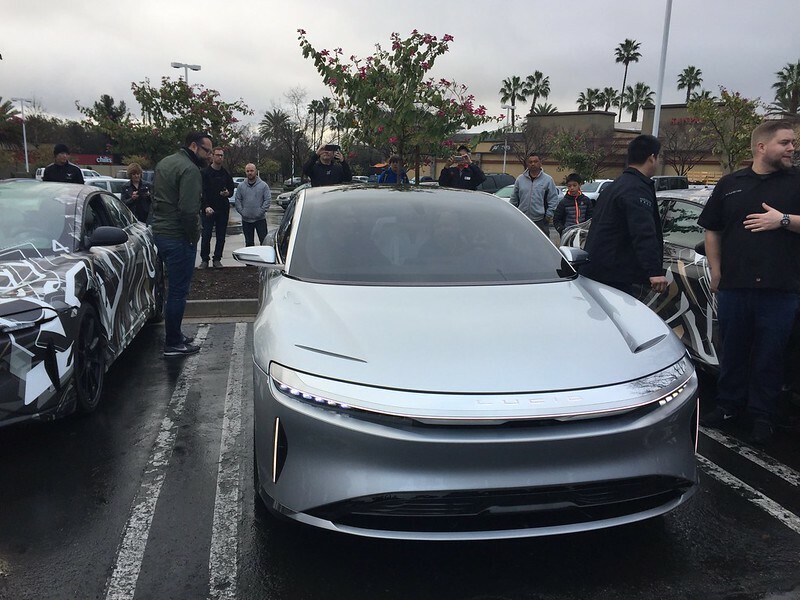 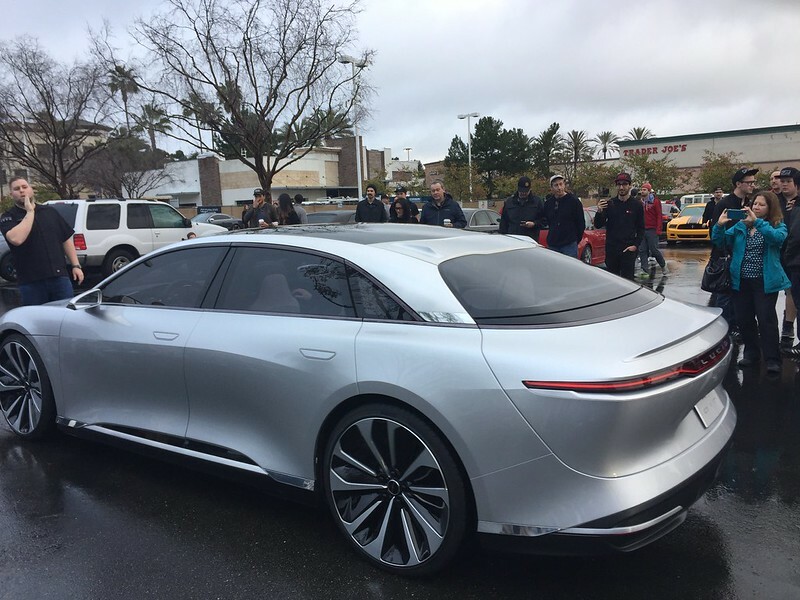 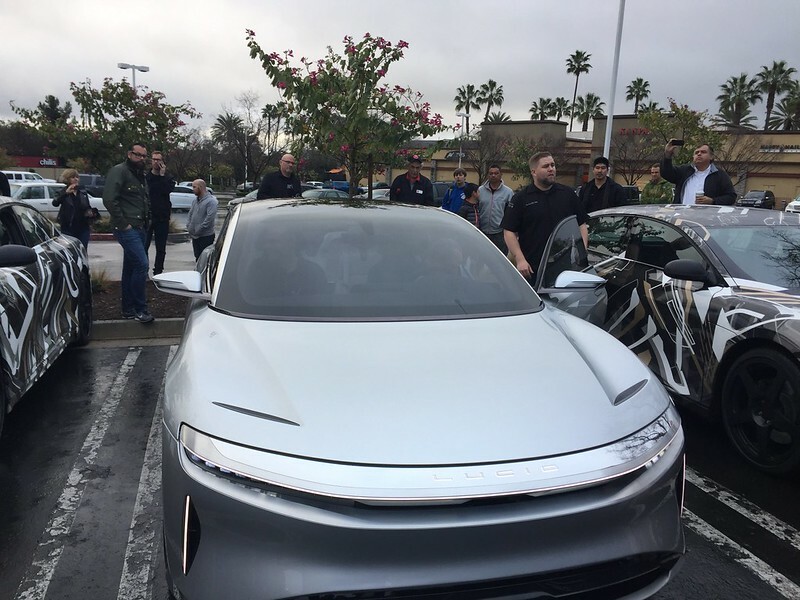 This weekend, Lucid Motors brought its EV, the Lucid Air to Southern California to show off its prototype vehicle. 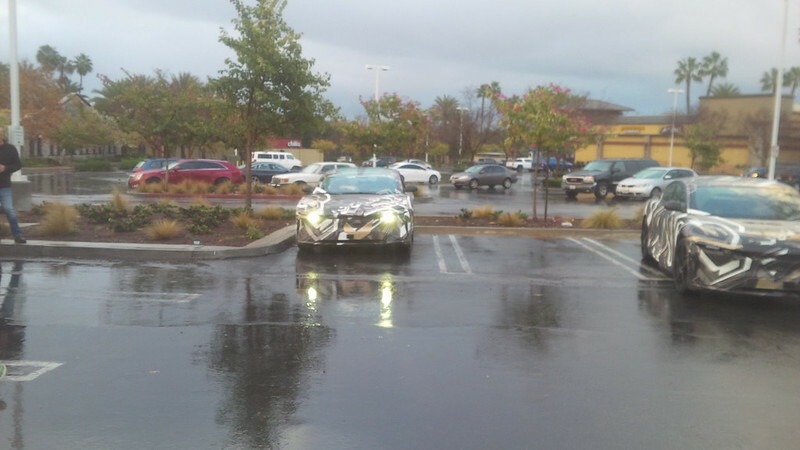 My first indication of this trip to Southern California was via twitter. 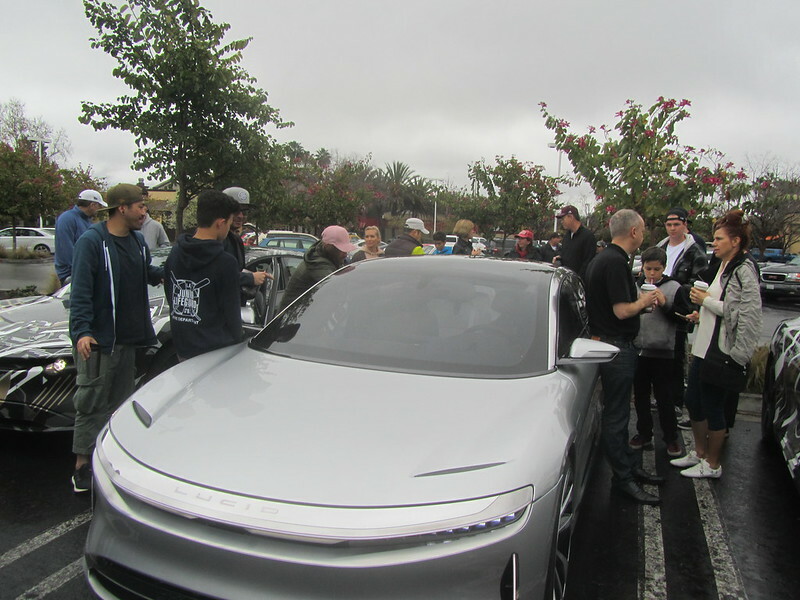 I was on a trip to Miami when the initial tweet went out and I figured to set up a meetup for the Tesla Owners Club of Orange County membership to attend one of the public “unveils” of this interesting new EV. 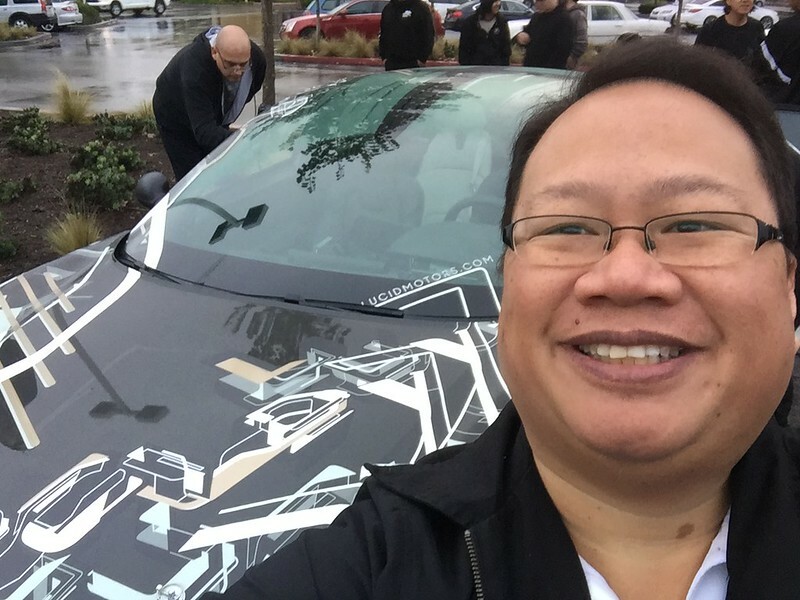 The club membership have many owners who are proponents of EVs in general as is evidenced by our early “reveal” of the Chevy Bolt EV a few months ago. 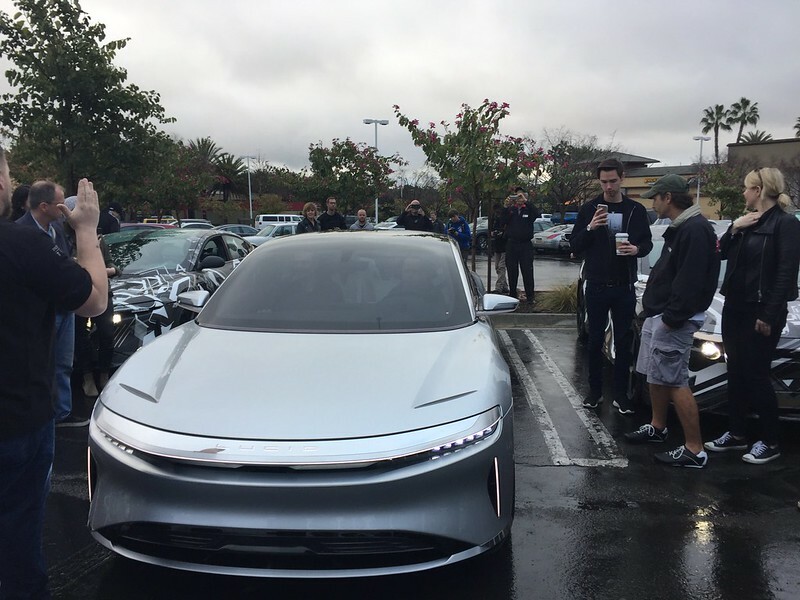 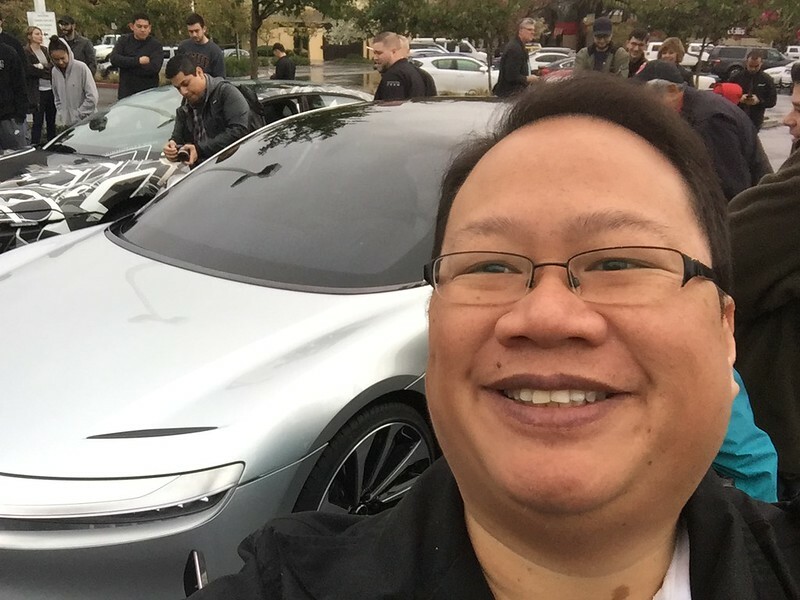 I was unsure whether or not I would be able to attend the event as my flight from Miami was scheduled to arrive around midnight on Friday evening and the Cars and Coffee in Aliso Viejo was scheduled at 7am on Saturday morning. 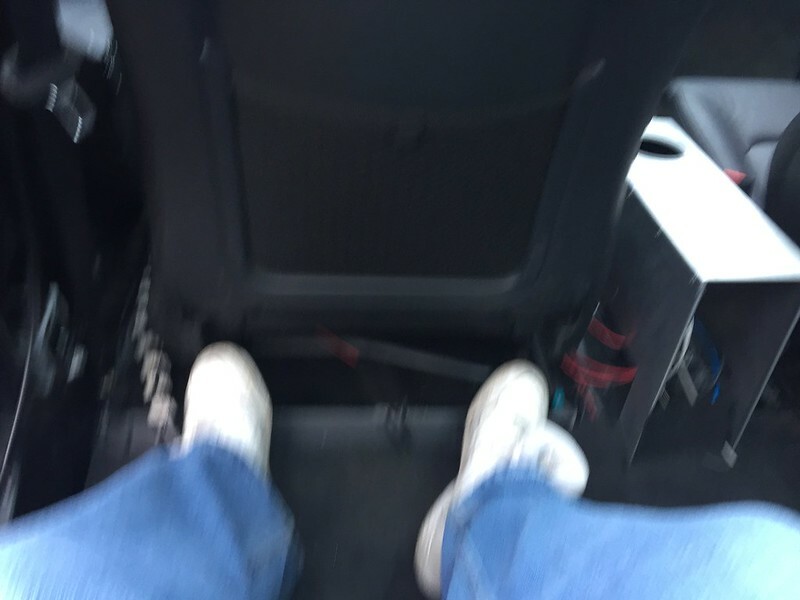 Things looked even worse when it turned out that our flight was subject to a gate hold for over an hour and I didn’t get home until 1am this morning. 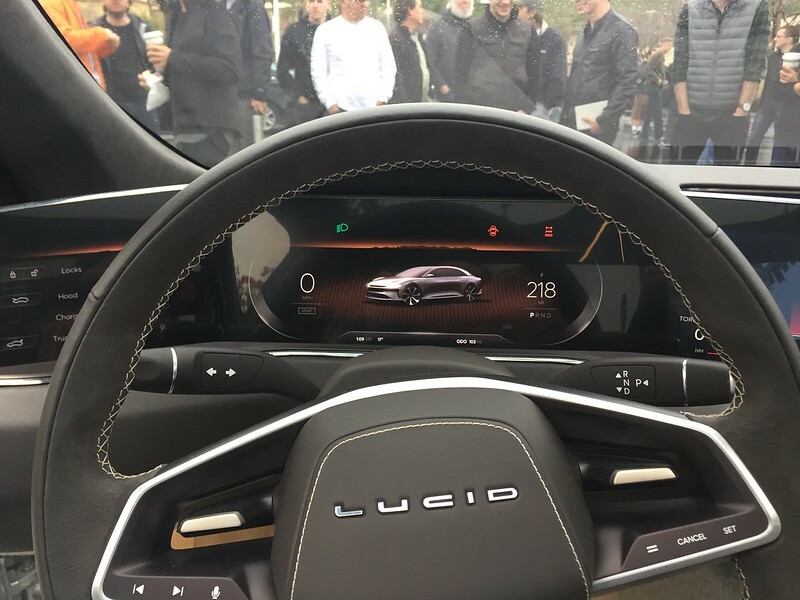 Well, Lucid first showed up with two Alpha Prototypes. 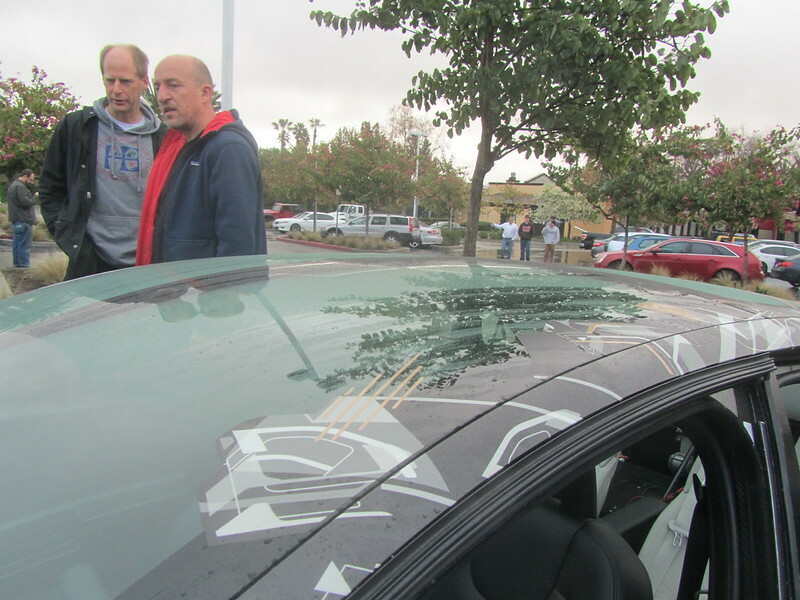 Around 7:10 AM, these two wrapped cars drove by while I was speaking with a few folks. 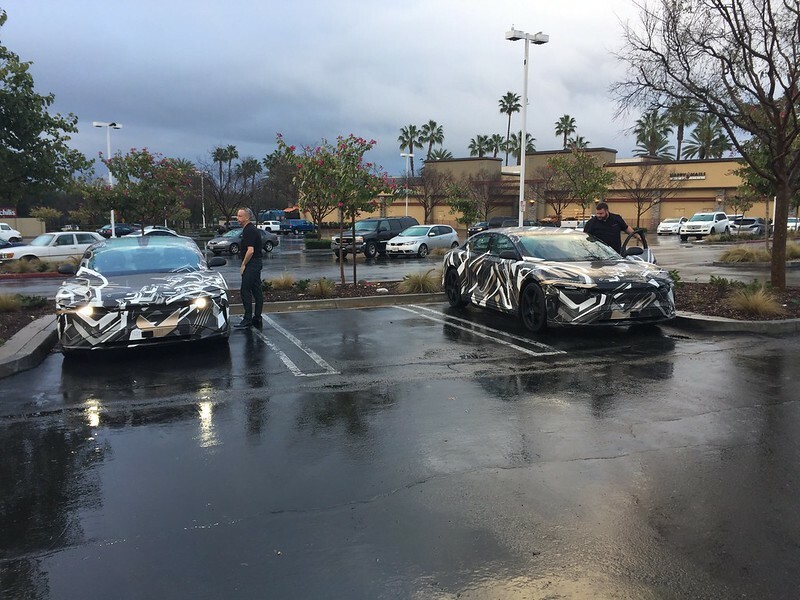 Here are some closer shots of the wrapped prototypes. 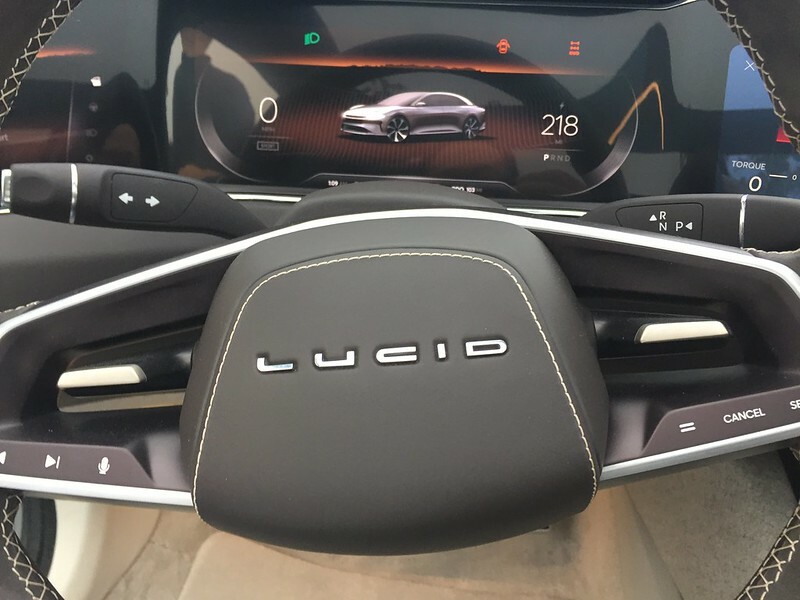 These early prototypes were not luxurious by any means, but provide a good idea of what sort of trim and style of seating that the Lucid Air will have. 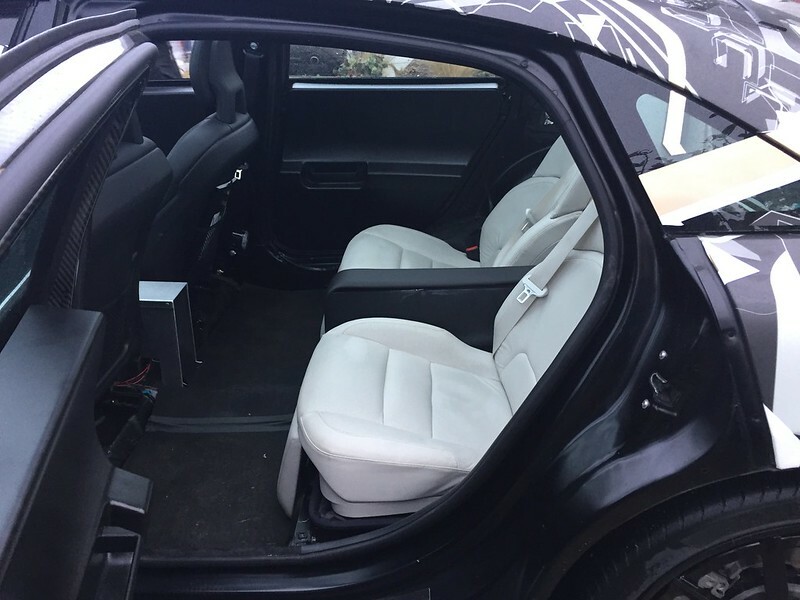 The car (that has the number 2 on it) has the bench seating in the back. 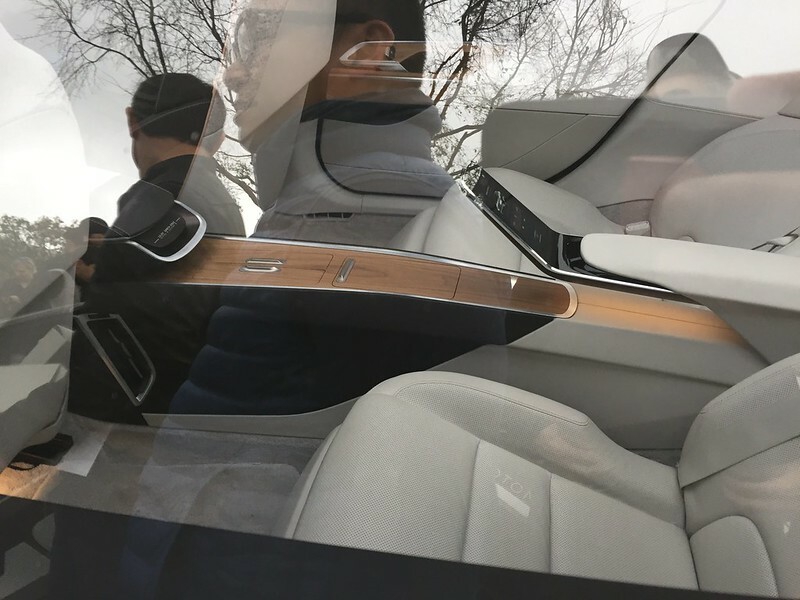 And the other car (the one with the number 4 on it) has a mock-up of an “executive” seating type of set-up (for China, and livery services perhaps.) 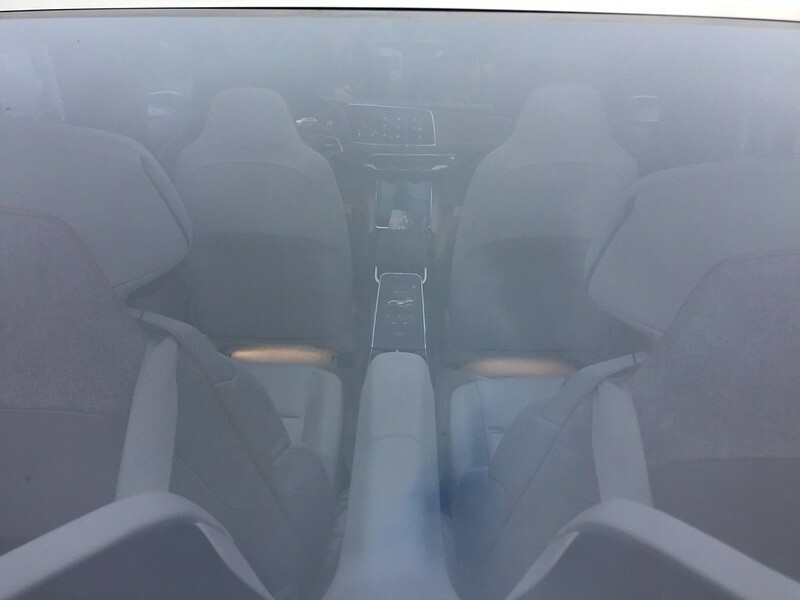 Additionally, the 2 car has a solid roof, whereas the one with number 4 has a panoramic (like the Model X, Model 3, or the new Model S fixed glass) roof. 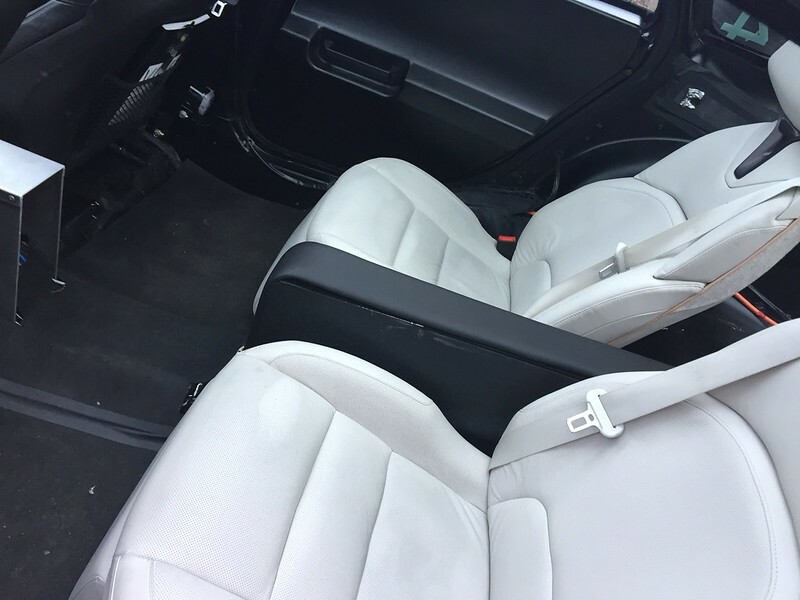 Here is the seating for the “4” car. 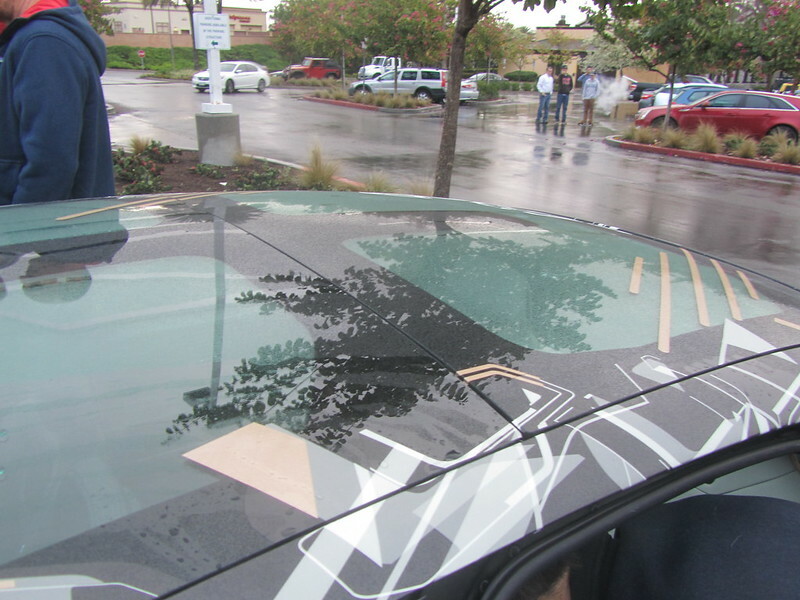 Here’s the glass roof on the “4” car. 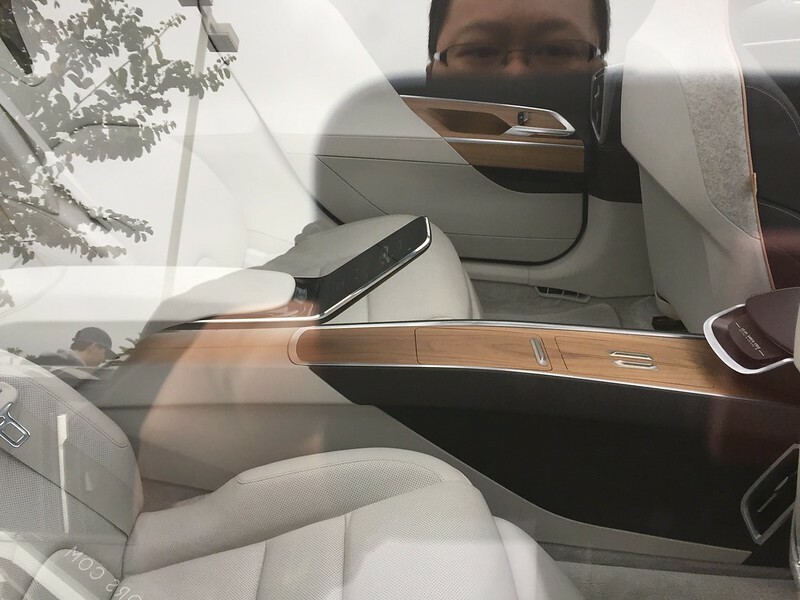 Here I am seated in the back of prototype “4” car. 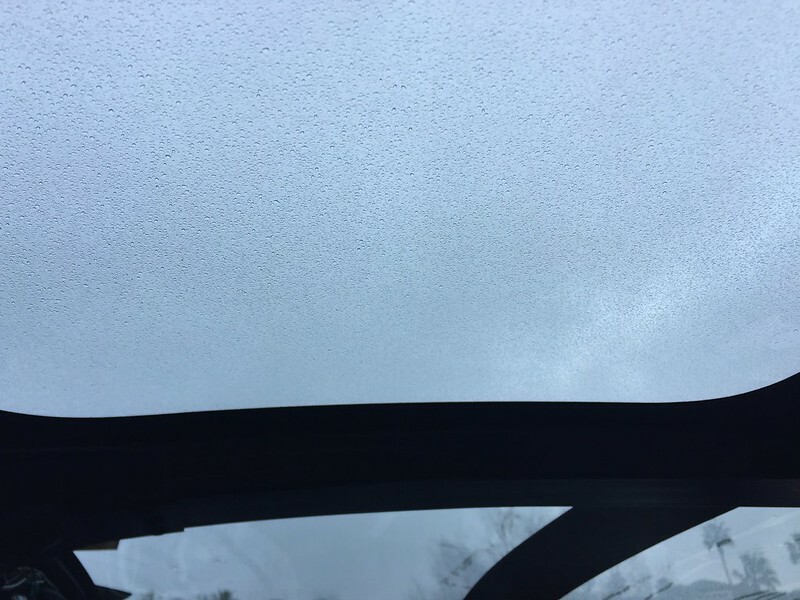 The view from the back seat. 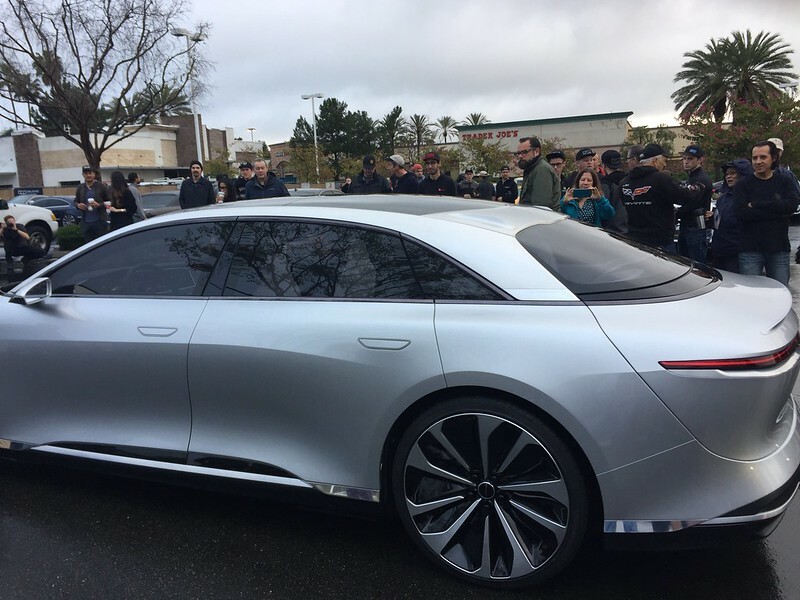 Lucid brought their “show” car out much later and it made for a dramatic entrance. 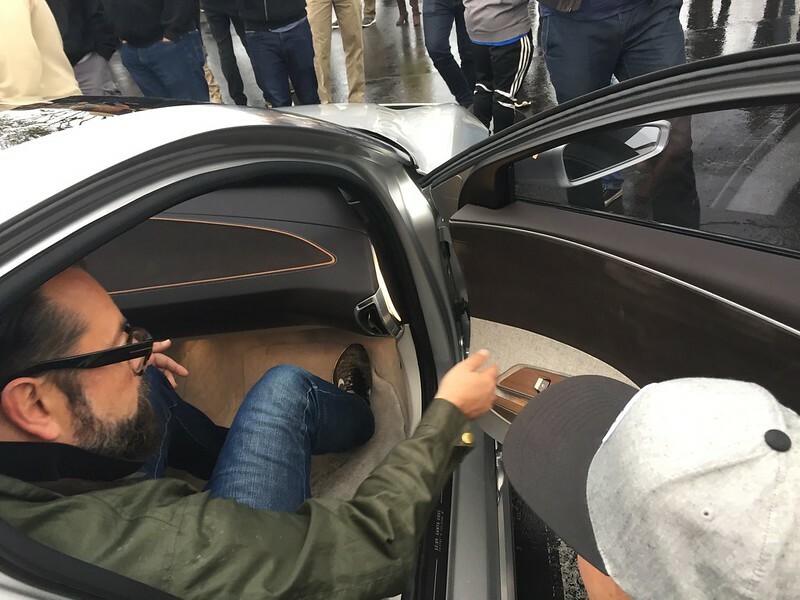 Peaking into the Show Prototype, we can see that Lucid opted to kit it out with the Executive Seating. 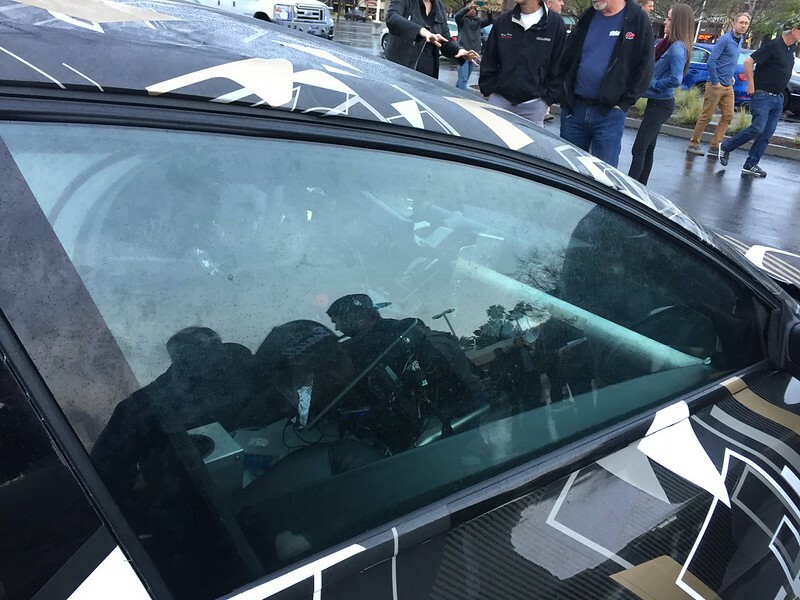 I took some pictures when others were able to grab a seat in the show car. 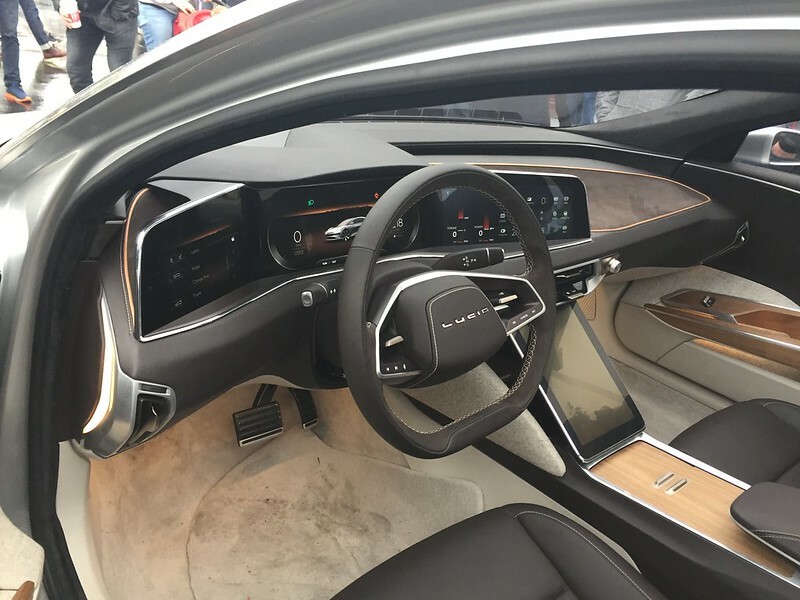 The interior trim looks good. 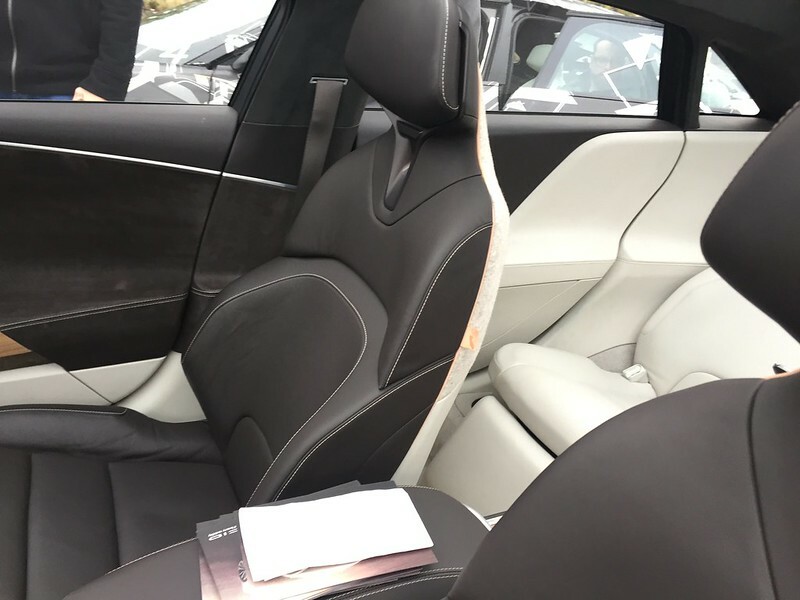 Here’s another shot of the Executive Seating in the back. 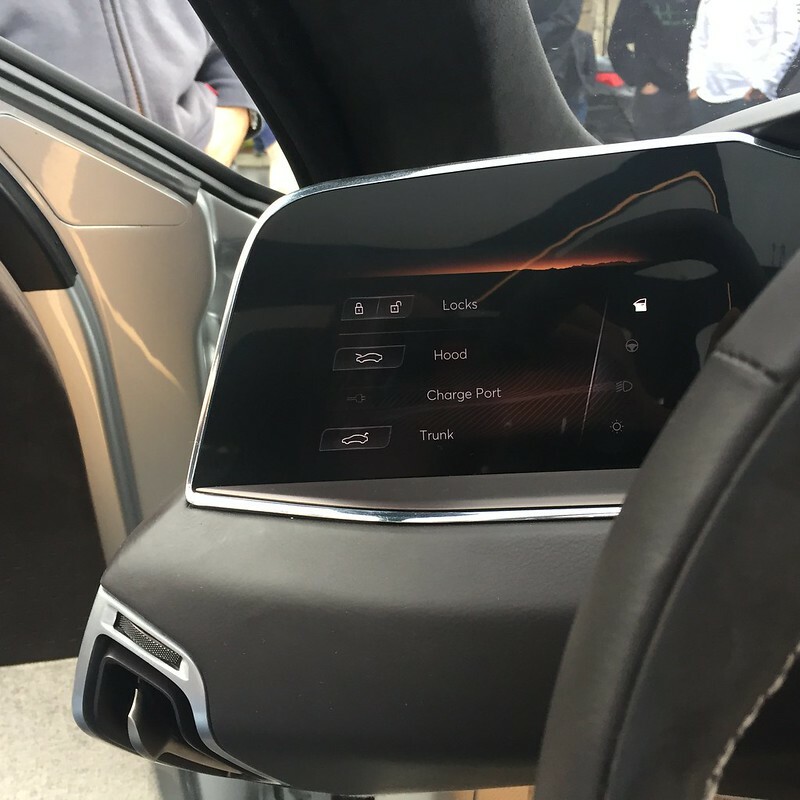 There’s a little touchscreen between the two seats for some controls. 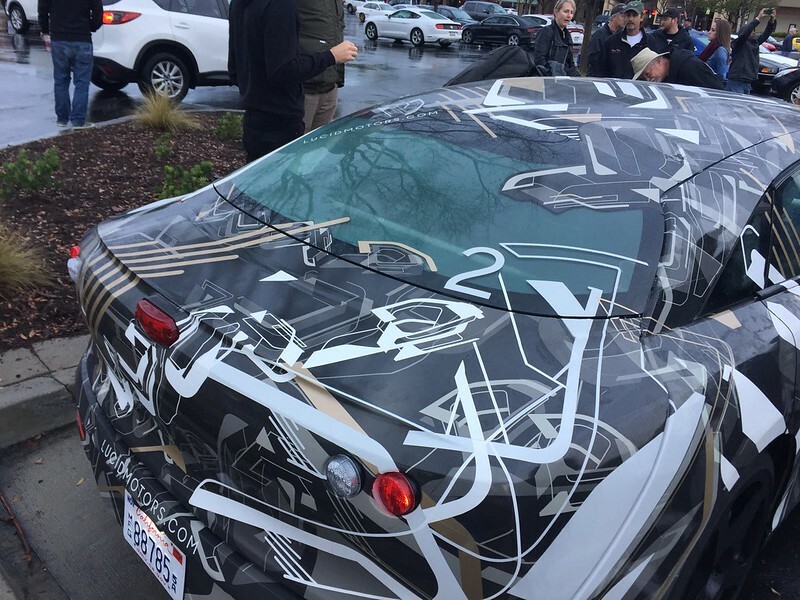 I didn’t see that up close, but it’s pretty cool. 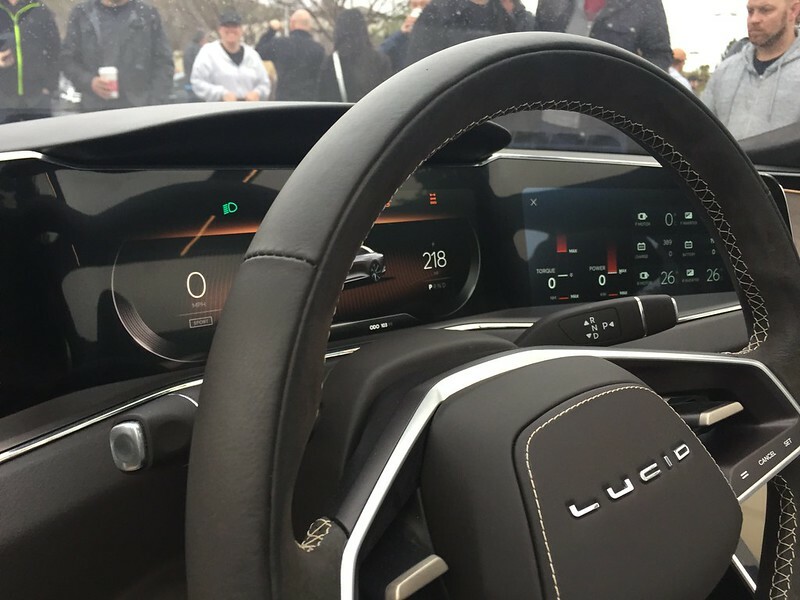 On the Show Prototype, Lucid opted to kit it with some cool things. 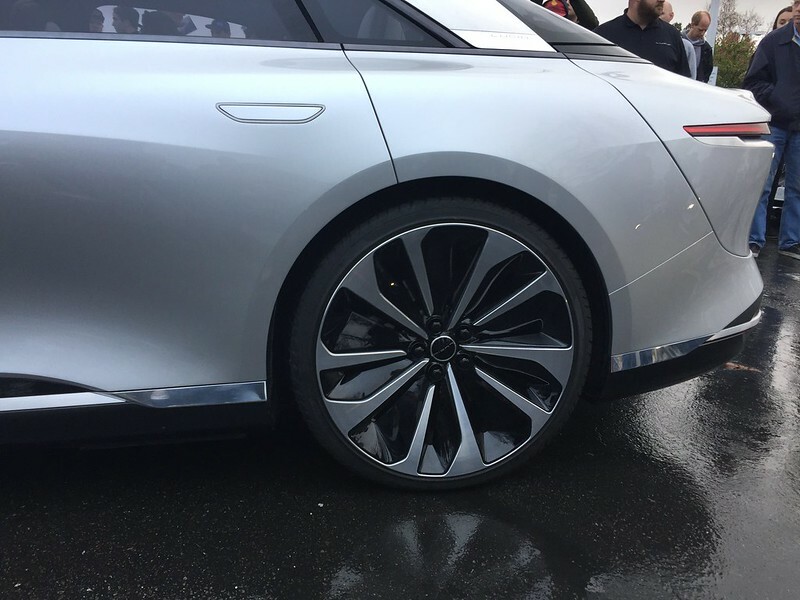 First, the tires and wheels are huge for a sedan. 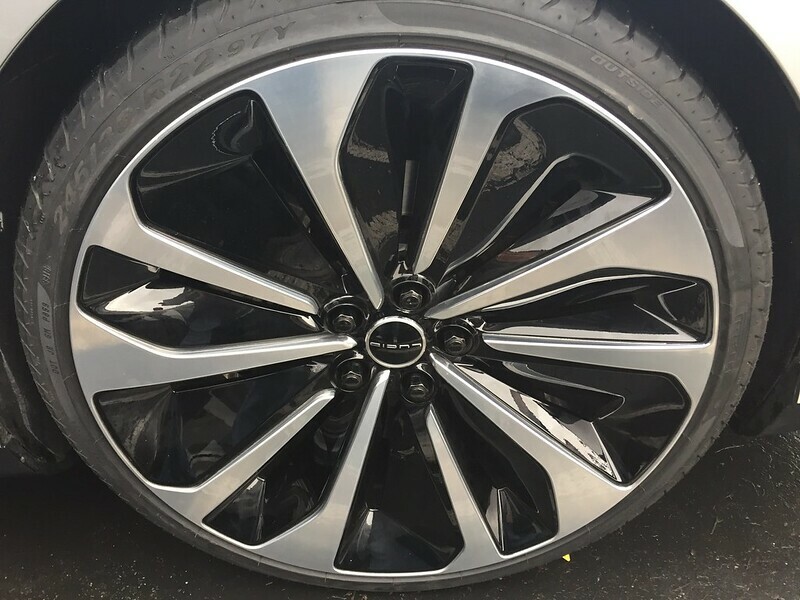 I think these are 22″ tires. 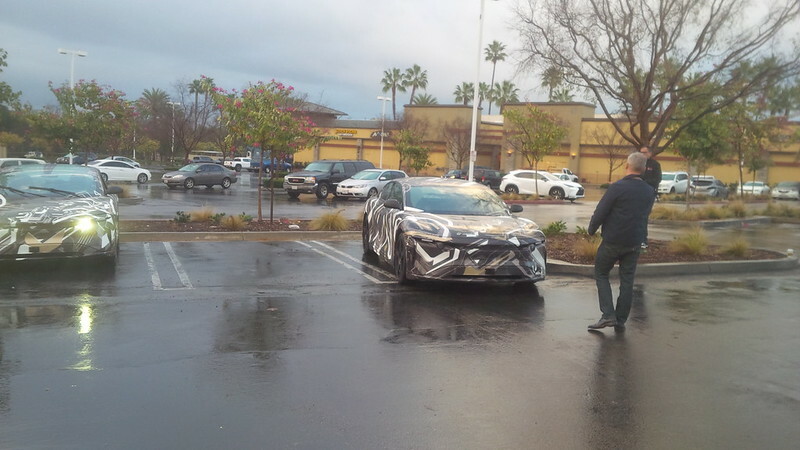 The front of the car is pretty sleek. 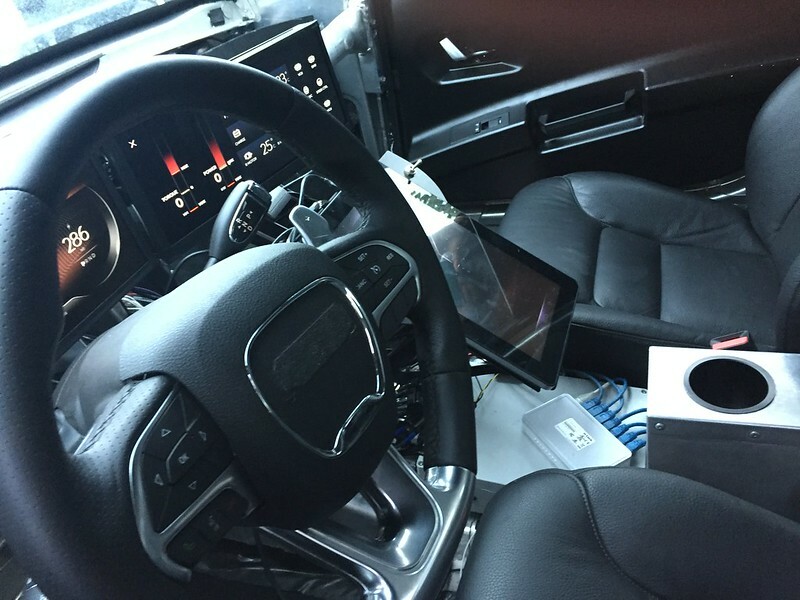 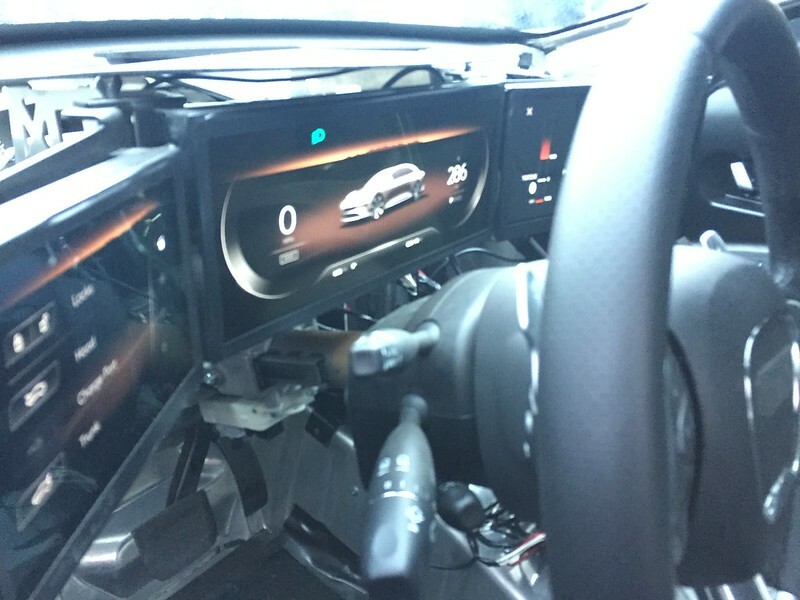 There is a LIDAR and camera in the very front to help the car in its autonomous functions. 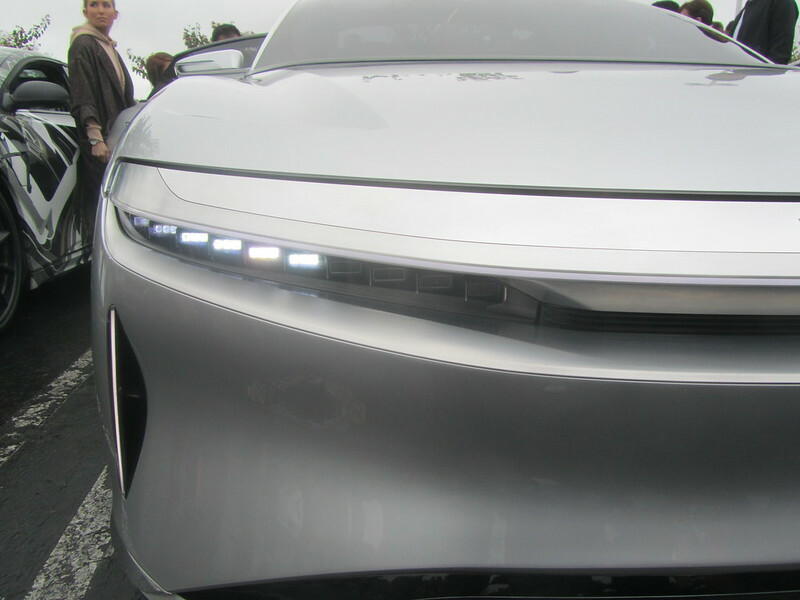 And the High Lumen LED lights look interesting on the Show Prototype. 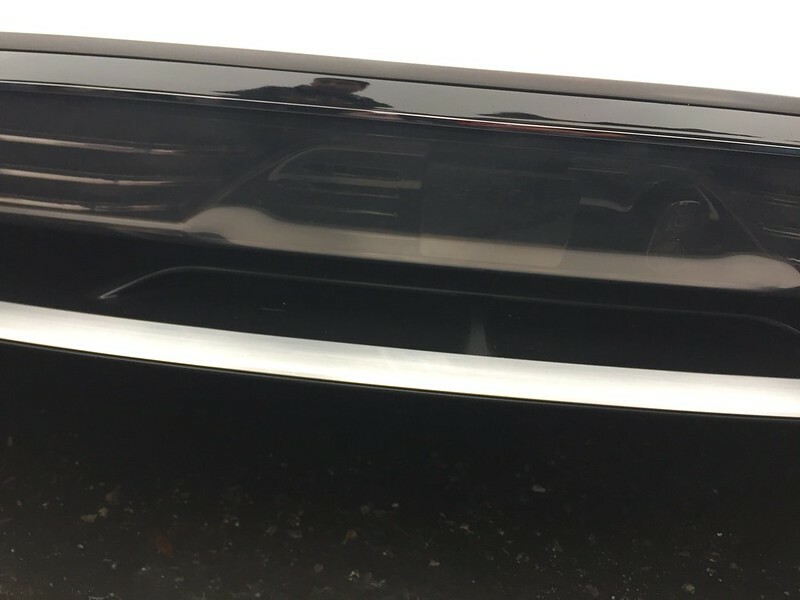 If you look at the front hood of the car, there seems to be two dark vents above the lights, and I was told that this provides a “vent” for the heat generated by the front lights of the car. 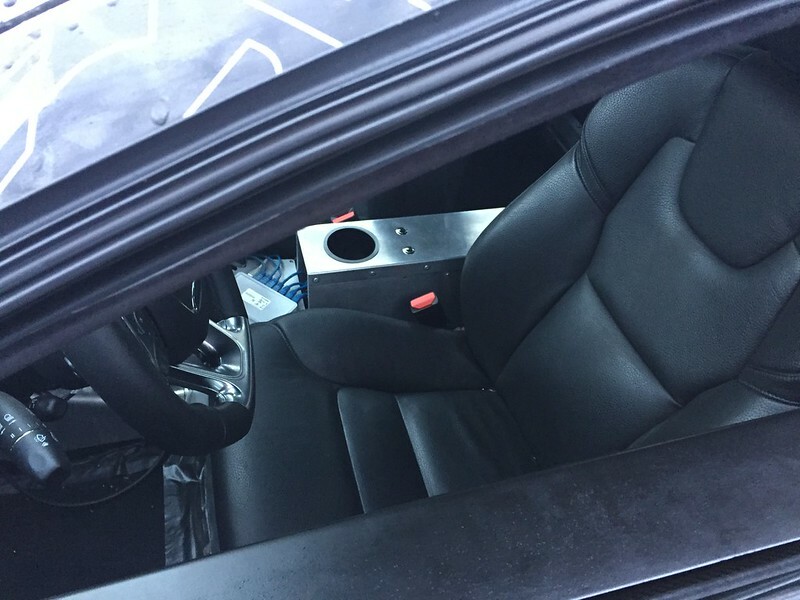 We never got to see the Trunk or Frunk or the charging port for the Show Prototype. 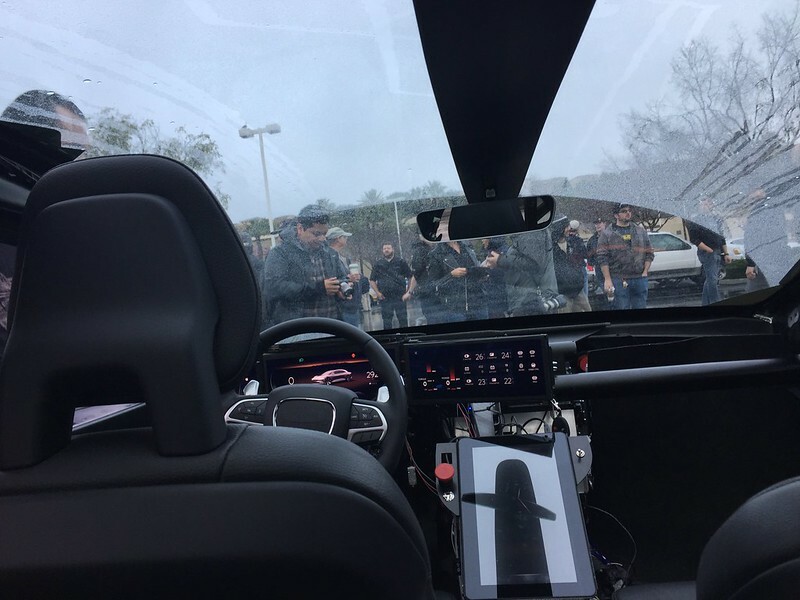 Actually, specific to the Show Prototype, the charging port is not accessible, (it’s in the Frunk for the Show Prototype.) 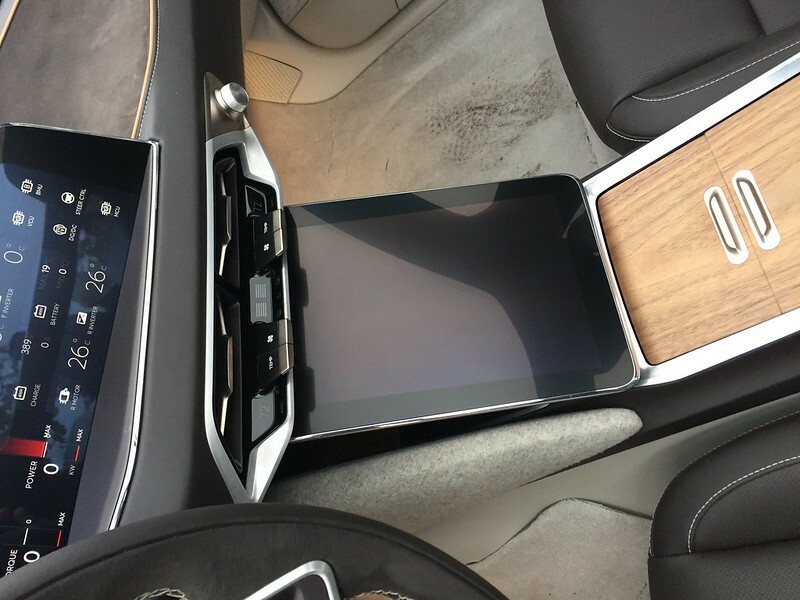 On 2 and 4, it is actually a front charging door by the driver side. 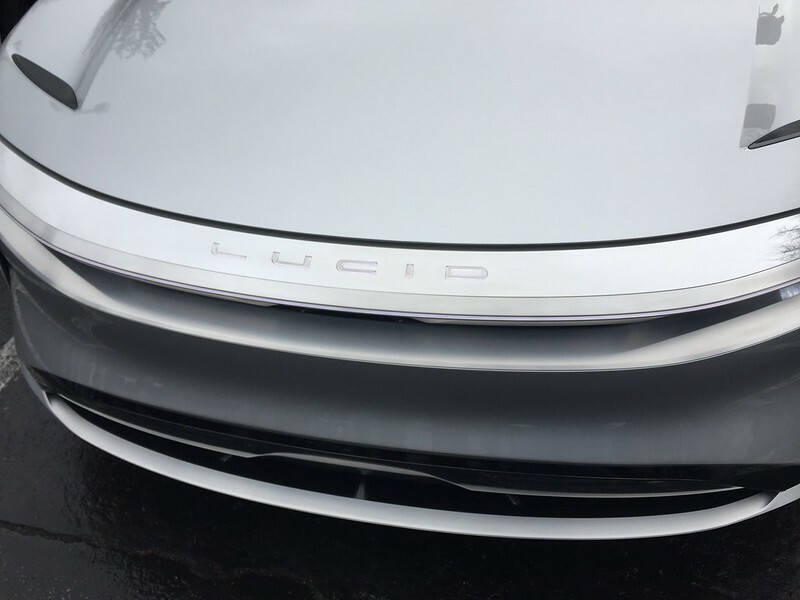 Lucid has not decided what to do for DC Fast Charging yet, and they are still considering technology for the released vehicle. 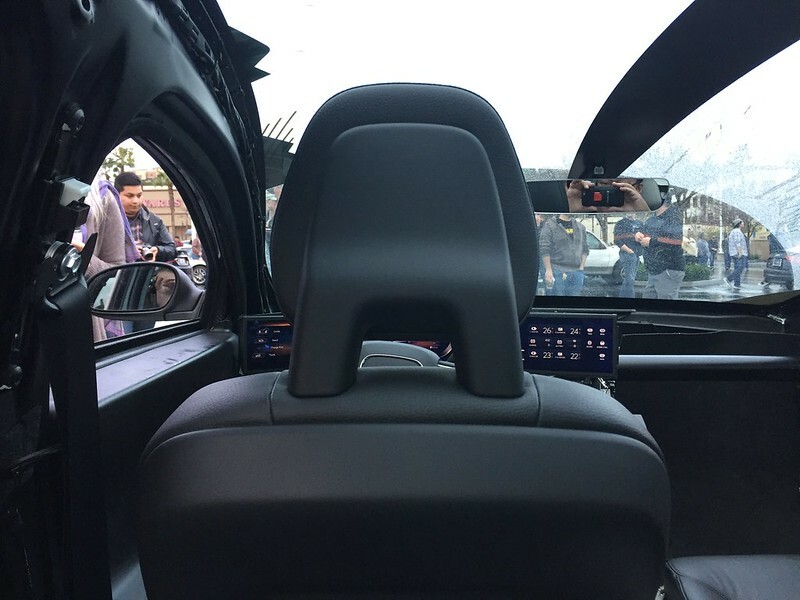 Here’s the front seat of the Show Prototype. 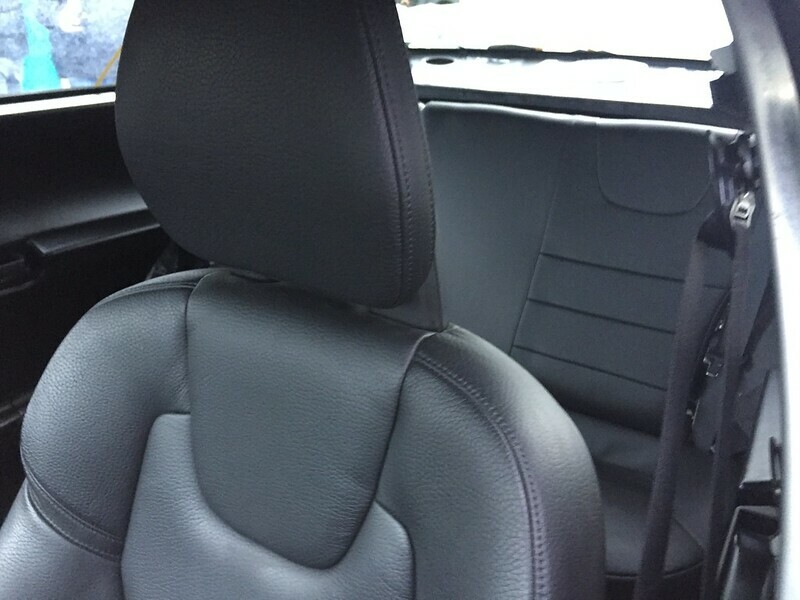 Looking at the back from the front seat. 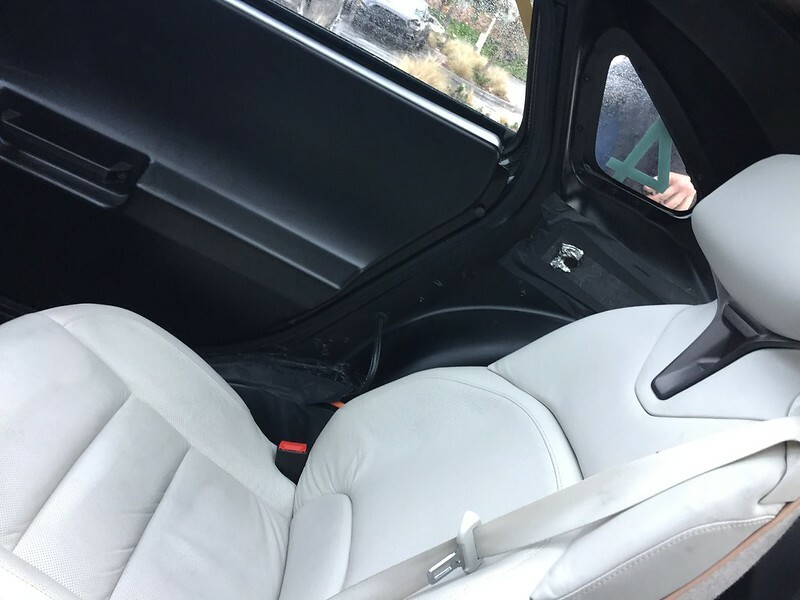 I got to sit in the front seat… And that was pretty cool. 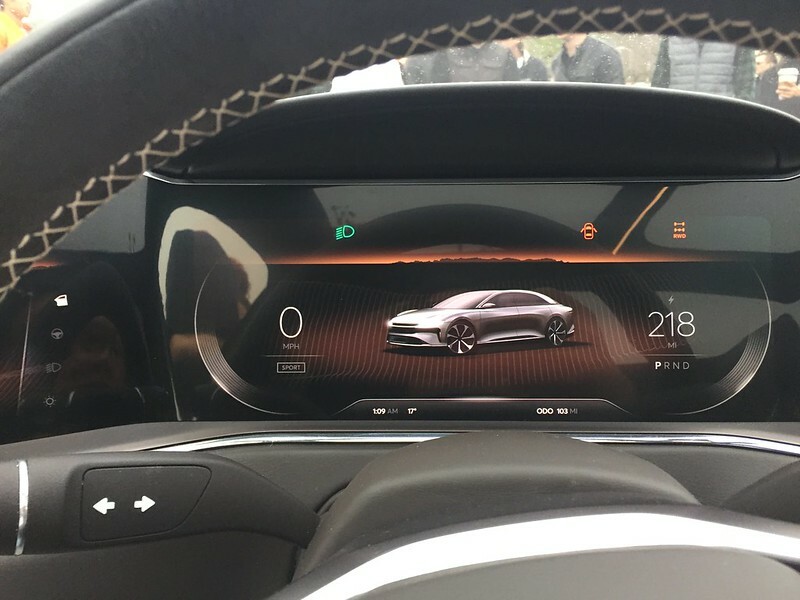 The cockpit looks great with this prototype’s finish. 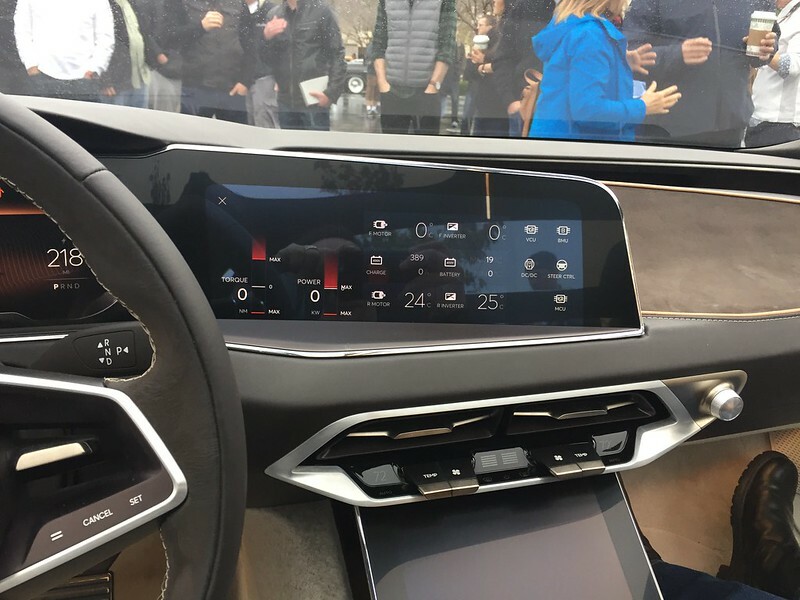 The three screens are filled with very useful information. 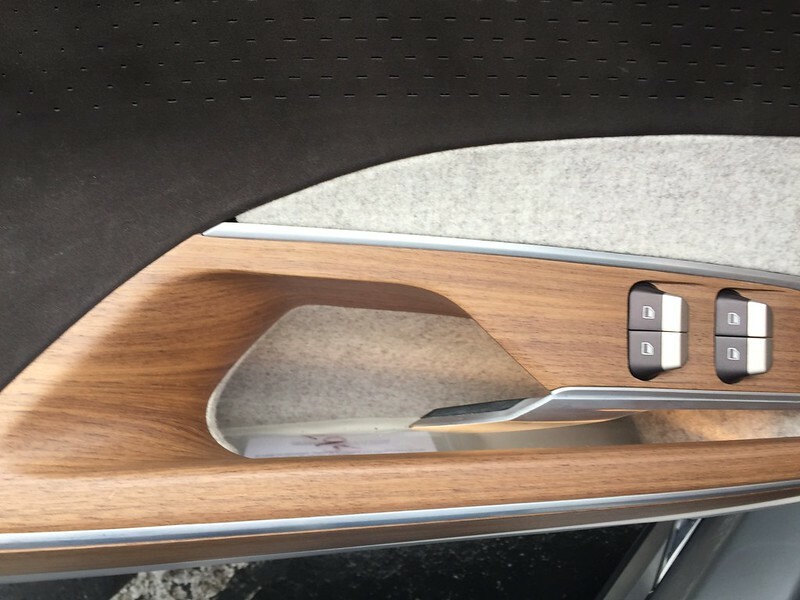 Here’s the wood trim on the door controls. 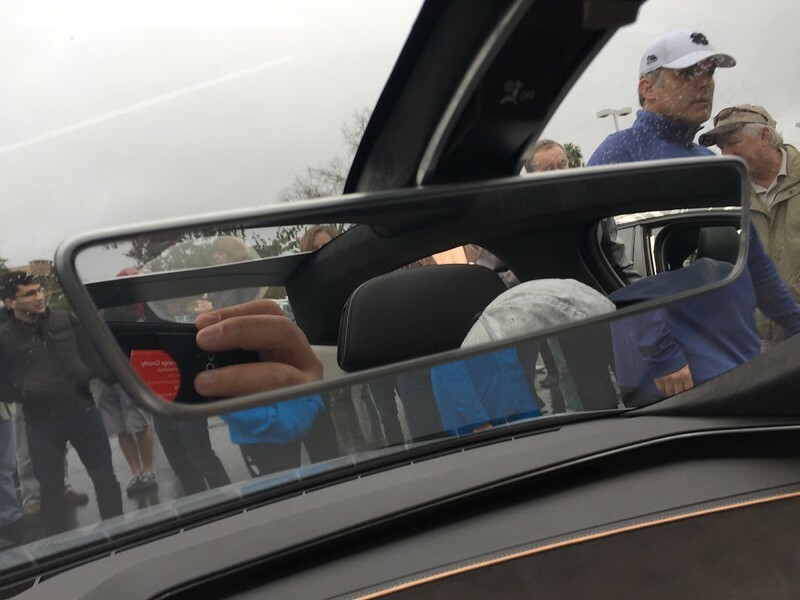 The show prototype had the same glass roof as the “4” prototype. 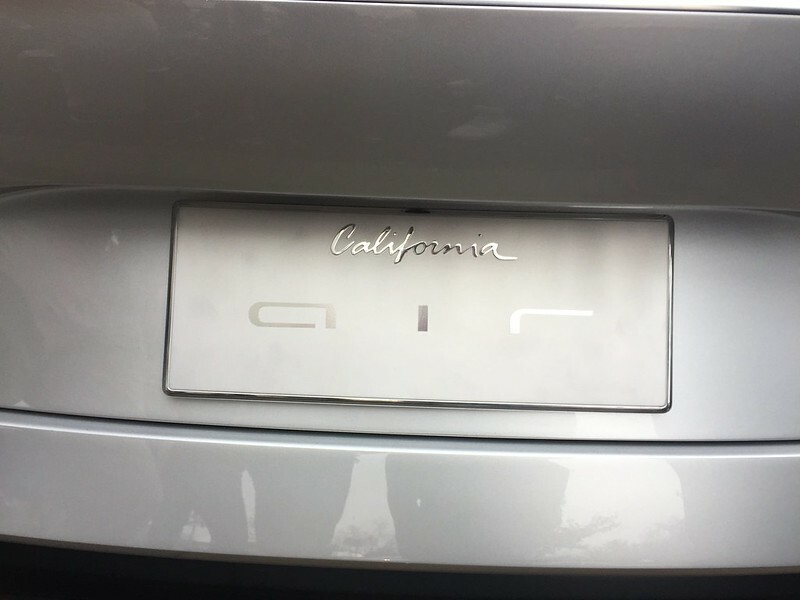 So, all in… It’s a great looking car. 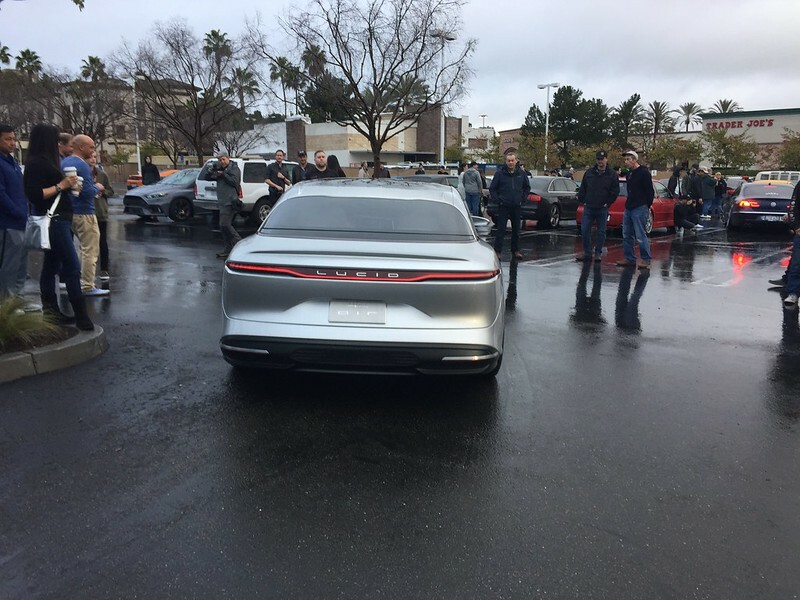 Unfortunately, this venue didn’t have test rides in the car, and we’re off to the second of two Southern California ride events this weekend and another post will follow with my impressions of being chauffeured in one of these cars. 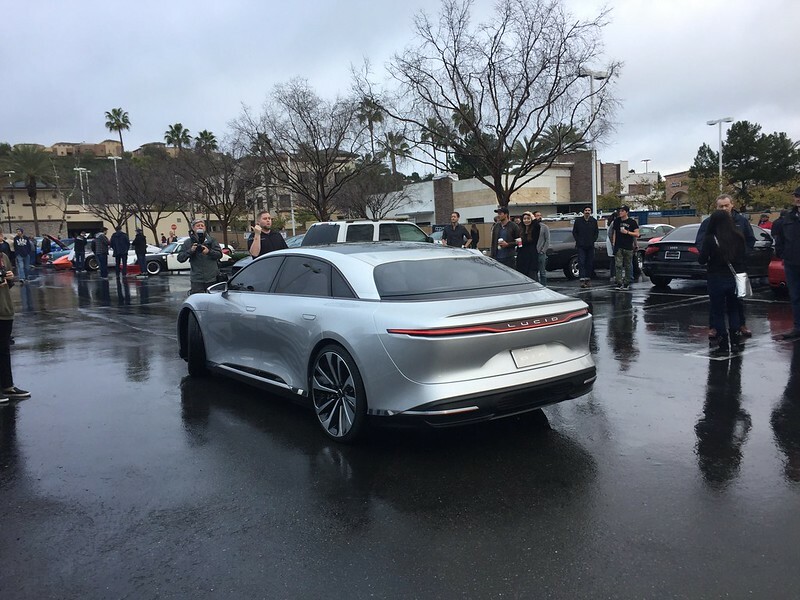 So, stay tuned as I will write about my further impressions from the events tomorrow. 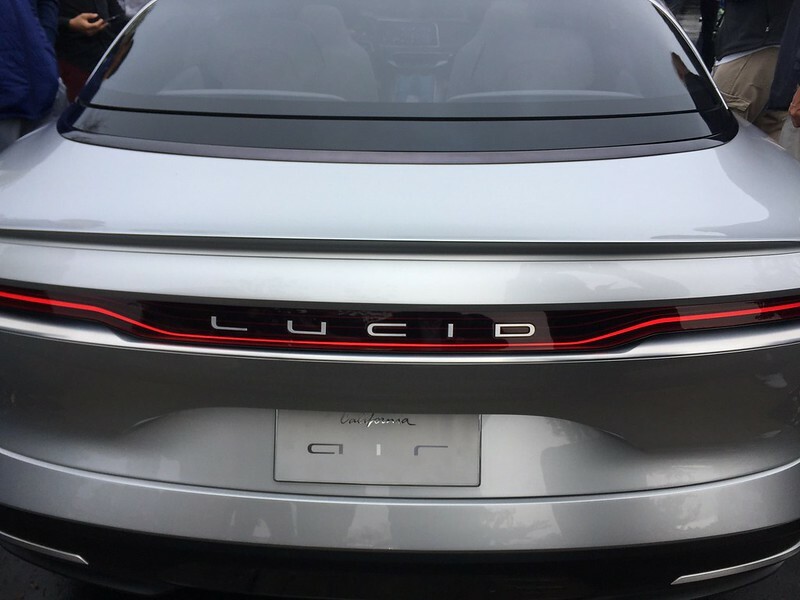 Click here for the Test Ride and Second Impression of the Lucid Air.